The UK government will send a minister to the US to ask the government to ratify an extradition treaty, amid a row over three former NatWest bankers. The "NatWest 3" will be extradited to the US on Thursday over alleged fraud offences linked to bankrupt Enron. Under the Extradition Act 2003 the men can be extradited to the US under a fast-track process, and tried there. The US has not yet ratified the treaty, which critics say means the UK does not have a reciprocal legal arrangement. However the government argues that the arrangement means both countries have to produce an equivalent level of legal evidence when seeking extradition from the other nation. Home Office minister Baroness Scotland will fly to the US on Thursday - where she will discuss a number of issues with her American counterparts, including US delay in signing the act. The treaty was originally intended to tackle terrorist suspects. Under its terms the US authorities need to outline the alleged offence, and provide "information that would justify the issue of a warrant for arrest in the UK". Britain must provide the US with evidence of "probable cause" if it wishes to extradite someone from America. The Conservatives and Lib Dems have raised doubts about what they perceive to be differences in the levels of evidence required in the above arrangement. But last week Prime Minister Tony Blair said: "It isn't true that the US has a different evidential burden from this country. "Probable cause... is now analogous to what we now provide under the extradition act." Former NatWest employees David Bermingham, Gary Mulgrew and Giles Darby have always maintained their innocence of "wire fraud" and say they should be tried by a UK jury. 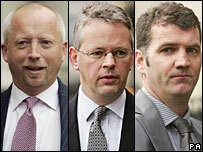 The three are alleged to have conspired with former executives in collapsed energy firm Enron over the sale of part of the company in 2000, which made them a total of $7.3m (£4.2m). There have been growing misgivings about their situation, with opposition politicians and business leaders criticising the attorney general's decision to refuse a UK trial. Now the Home Secretary John Reid has ordered that Baroness Scotland fly to the US to request reciprocity. She is not asking for the case to be tried in the UK but for the US to ratify the treaty from its end. The treaty needs a two-thirds majority in the US Senate to pass. The flight to the US comes as opposition leaders want the House of Lords to amend the Extradition Act to end the arrangement. In Monday's Financial Times, Baroness Scotland wrote: "I want to have the opportunity to explain face to face our frustration at the Senate's delay [in signing] without having to defend a spurious and wrong-headed amendment designed to score an anti-American party political point." Attorney General Lord Goldsmith has been firm in saying there is "no basis" to examine again the Serious Fraud Office's decision to let the US deal with the case and not prosecute in the UK.